It’s that time of year again; the time for cleanses and detoxes, to shrug off the old year and its inevitable conclusion of consumption and excess to beckon in a fresh new one and start again in a cleaner, brighter way. We often keep the focus more introspective, and after a few months of scrutiny on the needs of family and friends who can blame us for wanting to reflect our attention inwards? Whether on our health and diet, our physical or mental fitness, it is unavoidably the time for reassessing goals and making resolutions and commitments – often to tidying up our lifestyles. With the focus so intently trained on self-improvement, it’s easy to neglect to look at the environment that we inhabit, the wider world that we impact every day. If we can tidy our lifestyles to improve our own health, then tidying our lifestyles to improve the health of the planet is only a step ahead. The government has put an emphasis on environmental improvements with the detailed 150 page 25 year plan; Theresa May mentions the success of the 5p charge decreasing plastic bag use by 83% which demonstrates that each of us can have a huge effect on the efficacy of environmental policies and therefore the environment with small individual changes every day. Not many household products can boast the ability to benefit both the user and the environment. The OT200 Hoist’s unique Dynamo Gravity powered charging can offer just that – whenever the hoist is used and someone is lifted up or lowered, the kinetic energy of the belt descending is transferred to electrical energy to recharge the battery. This hybrid power vastly improves the life of the battery before charging, allowing up to 100 uses before needing to be recharged. This not only elongates usage and time between charges but contributes to the unobtrusively and with no extra effort to the small individual changes that make such a difference to our environmental impact. 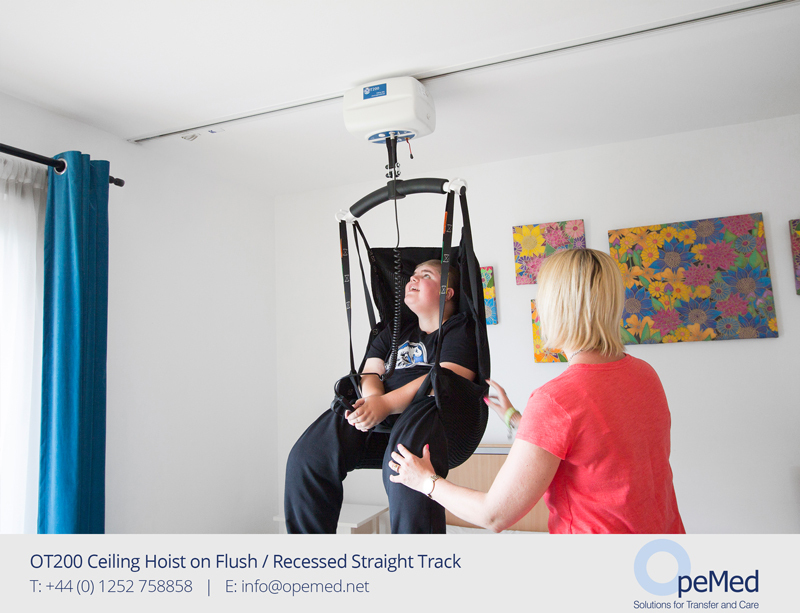 The award-winning OT200 Compact Ceiling Hoist is the smallest professional-use patient hoist on the market. With a unique gravity-powered system to recharge whenever in use, the OT200 can substantially save service costs and can remain charged for more than 150 lifts. Also featuring an emergency lowering function which does not require tools, the award-winning OT200 is a cost-effective, flexible solution that can be installed in virtually any setting. The OT200 has been utilised into an array of locations. 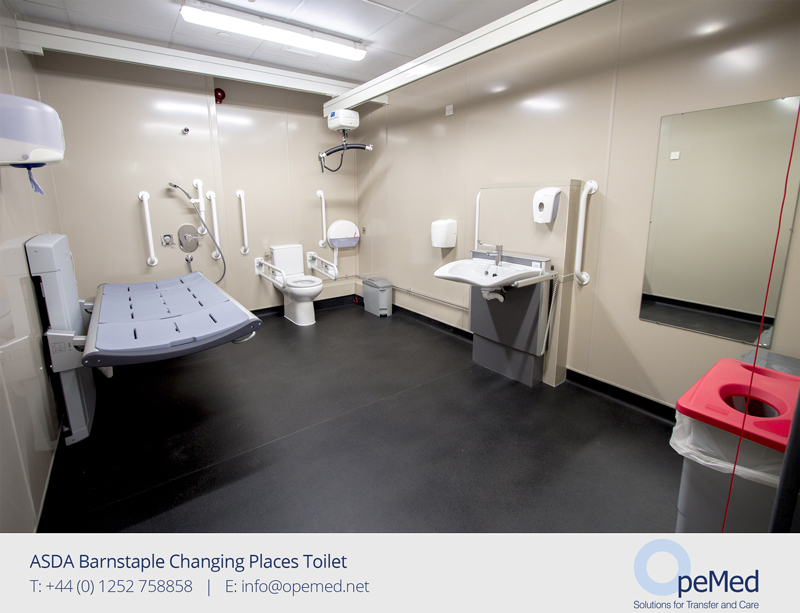 From Changing Places toilets to Nursing Homes, Hospitals and Rehabilitation Centres, Leisure Centres, Individual Homes and more. Whatever your location our Product Specialists can create adaptable designs bespoke to your environment. 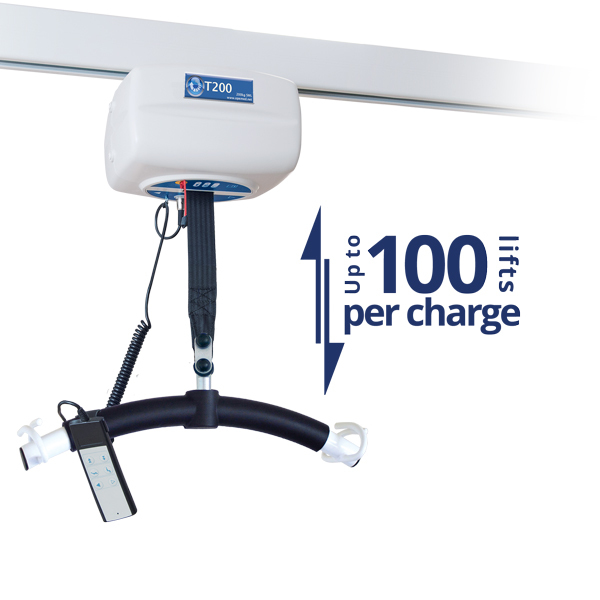 If you would like to discover more about the OT200 Compact Ceiling Hoist with hybrid technology, simply call 01252 758 858 or contact us online here. Our team of experts are available for no-obligation consultations, on-site visits, structural support, installations and servicing.